MONTEREY, California -- A young white shark on exhibit at the Monterey Bay Aquarium for the past five months was tagged and returned to the wild shortly after sunrise today (Tuesday, February 5). It marks the third time in four years that the aquarium has exhibited a white shark and then returned it to the wild. Monterey Bay Aquarium remains the only aquarium ever to exhibit the ocean’s top predator for more than 16 days. Aquarium staff released the male shark from a boat in Monterey Bay after fitting him with two electronic tags: one that will relay near real-time data about his travels for about eight months, and a second that will collect detailed information on his movements for the next five months. Data from the second tag, documenting where the shark goes, how deep he dives and the water temperatures he favors, will be relayed to scientists via satellite when the tag pops free in early July. Tag data will be posted to the Tagging of Pacific Predators (TOPP) web site, www.topp.org. The shark had grown from an initial length of 4-foot, 9-inches and a weight of 67 � pounds when it arrived on August 28, 2007 to its current size of 5-foot, 10-inches and 140 pounds. He was healthy and feeding at the time of release, but had recently been seen leaping into the air above the million-gallon Outer Bay exhibit where he was housed, said Randy Hamilton vice president of husbandry for the aquarium. “We’ve again learned some new things about caring for white sharks, and we expect he’ll do well after release, just as our first two sharks did,” he added. In 50 years of attempts by aquariums around the world, this marks only the third time a white shark has survived more than 16 days on exhibit. Similarly, this was only the third white shark to consistently take food offered by aquarium staff. 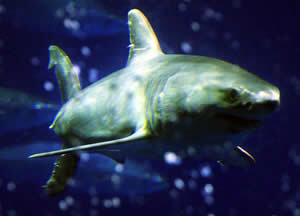 The first shark in Monterey , a female, was at the aquarium for 198 days in 2004-2005. The second shark, a male, was on exhibit for 137 days. The latest white shark was seen by more than 650,000 people during its 152 days on exhibit. That was about 8 percent more visitors than aquarium officials had anticipated during the period and slightly below attendance levels for the prior year. The shark was caught accidentally on August 4, 2007 off Ventura by a commercial fisherman, and held for 24 days in a 4-million-gallon ocean pen off Malibu . He was feeding and navigating the waters of the pen before he was brought to Monterey . Through its White Shark Research Project, the aquarium has worked since 2002 to learn more about white sharks in the wild and has three times brought a white shark to Monterey for exhibit. During that time, the aquarium and its research partners have tagged and tracked 12 juvenile white sharks off Southern California . The aquarium has allocated more than $1 million to white shark field research since 2002, with much of the money supporting the tagging of adult white sharks off the Farallon Islands and Point A�o Nuevo. Shark researchers with the Tagging of Pacific Predators, led by Dr. Barbara Block and her colleagues at Stanford University ’s Hopkins Marine Station, have tracked 143 adult white sharks off the Central Coast using data-collecting tags. Information from the tags has provided new insights into the far-ranging travels of white sharks in the eastern Pacific, according to Dr. Block, a marine biologist and principal investigator with TOPP. Each of the three white sharks brought to Monterey has been “a powerful emissary for ocean conservation,” said aquarium Executive Director Julie Packard. Surveys of aquarium visitors who saw the first white shark found many of them reporting that they came away from the experience with a deeper understanding of the need to protect white sharks and their ocean homes. During their time at the aquarium, visitors not only see the white sharks, they learn about white shark conservation issues in conversations with staff and volunteer guides, and new exhibit graphics specifically addressing the threats facing white sharks. Beyond its exhibit program and involvement in white shark field research, the aquarium supports shark conservation through initiatives like Seafood Watch, which creates pocket guides for consumers and education campaigns among restaurateurs and retailers aimed at transforming the seafood market in ways that support sustainable fishing and fish-farming. I was able to see the first two sharks at the aquarium during their stay. Truly awe inspiring! Even at 5 feet, these two exhibited the attitude of a true apex predator. Thank you to MBA for allowing me this chance to see these wonderful creatures. As if an appropriate environment could be provided to a healthy wild animal in captivity, let alone a great white shark. THEY SHOULD ALL BE LIBERATED. I have visited Monterey Bay and found it to be a wonderful and worthwhile experiance. I applaud them for their efforts to learn more about these wonderful animals. Only through our continued quest for knowlege will we be able to protect their habitats and ensure their continued involment in the oceans ecosystems. Because of Monterey Bay the knowlege to safely host great whites in captivity has been obtained, and the possibility of educating the public around the world is possible.